Explore downtown Nashville's hopping music and nightlife district with a pass worth $45, divided into $15 vouchers to spend at each of three honky tonk bars. Tap your feet to live music while sipping genuine moonshine, local draft beers, or a selection of whiskeys at these honky tonk bars, each of which boast a lot of character and great tunes. 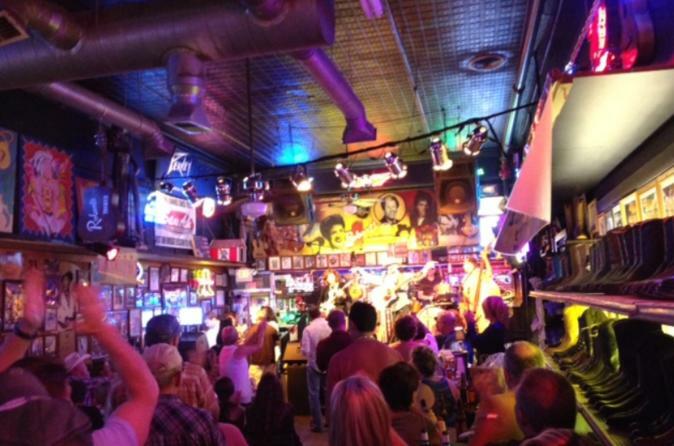 This pass provides you the opportunity to discover the best of the many honky tonk bars in the birthplace of country music! Honky tonks are thought of as loud, roudy bars that feature live country music—where people go to dance, drink, and have a good time. Nashville's reputation for great music goes hand in hand with the honky tonk as many country musicians get their start playing in these bars. With this pass, you can visit some of Nashville's lively honky tonks while enjoying the savings afforded by the pass. Bring your three $15 vouchers to spend at each of three honky tonk bars on your visit to the lively 2nd Ave district in downtown Nashville. Located within a few minutes walk from one another, each bar boasts its own down-home style and the country music that makes Nashville famous. AJ's Good Time Bar is owned by Country Music Superstar Alan Jackson and was recently voted the number one honky tonk in Nashville by Billboard Magazine. The bar carries on the tradition of the best downtown honky tonks with the kind of country music that made Nashville famous. This venue features three multi-faceted floors and a roof top bar with the most stunning view of the city. Bootlegger’s features 13 flavors of moonshine made from the recipe of famous moonshine maker Popcorn Sutton, who transformed his illicit moonshine production into a successful business. Most nights of the week you can hear live music, from bluegrass to modern country, in this intimate venue. No food is served here. Not far away, you will find Doc Holliday’s Saloon offering a selection of whiskeys and local beers on tap. Listen to your favorite tunes on the juke box as you sip a drink and soak up the friendly atmosphere of this small joint. Your pass provides three vouchers at a best honky tonks in Nashville, the right way to start a night out in Nashville!